You'll be £14.99 closer to your next £10.00 credit when you purchase American Eagles. What's this? At the outset of WW2 there were a good number of US pilots who flew with the RAF prior to the USA becoming directly involved with the war. A couple were already here in the UK, and members of the Auxiliary Air Force, while others volunteered by crossing into Canada after the recruitment within the USA for foreign armed forces was banned. The reasons behind them volunteering would have been varied according to the individual. Some might have done it for the country they saw as their family homeland, some to stop the spread of Nazism and others simply for the adventure. This chronicles the story of these volunteers in pictures, showing both the men and the aircraft they flew. It splits into 6 chapters, with Pre-war pilots; Early Action; Eagle Squadrons; Fighter Command; Yanks Abroad; and finally Nigtfighters. 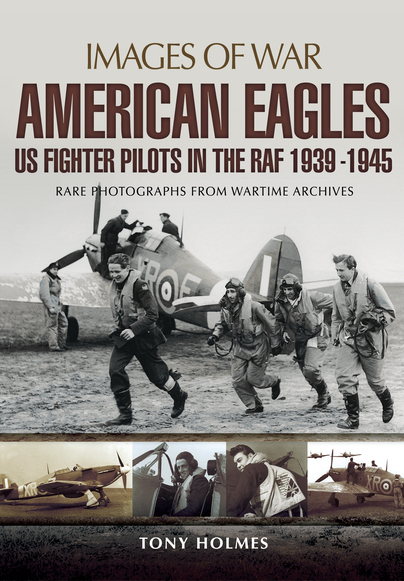 With a fine collection of archive photos it illustrates the involvement of the US airmen who flew for the RAF during the early period of the war and when numbers grew, to the formation of 'Eagle Squadrons', manned by US aircrew. It wasn't until 1942 when the USAAF became involved in the war itself that these units, 71, 121 and 133 Squadrons were transferred to the US Eighth Air Force at Debden. This wasn't the end to it however, as some American pilots continued to serve in the RAF and not only in the UK. Among the illustrations are those flying Spitfires from Malta during the heroic defence of that island and later with pilots and crews of night fighters and intruders through to the end of the war. So added on to the early pictures of mainly Spitfires and Hurricanes, the later sections feature Mosquitoes and Beaufighters as well. All well captioned, this is a fine collection of photos, many of which I had not seen before and they contain plenty for the aircraft historian to enjoy along with plenty of detail on camouflage and markings, including some nose art in a number of cases, which I am sure modellers will equally find useful. Another good aviation themed title in the Images of War series from Pen and Sword. A Western Australian by birth, Tony Holmes was a published aviation author by the age of twenty. Moving to England in 1988, he has worked in aviation publishing ever since. Tony has written more than 50 books and edited a further 300 in the past 25 years.